BOOK 4 — Imprisoned for brawling in Acre, a coastal city in the Kingdom of Jerusalem, Talon and his longtime friend Max are freed by an old mentor from the Order of the Templars and offered a new mission in the fabled city of Constantinople. There Talon finds that winning the Emperor’s favor obligates him to follow the Emperor to war in a willful expedition to free Byzantine lands from the Seljuk Turks. 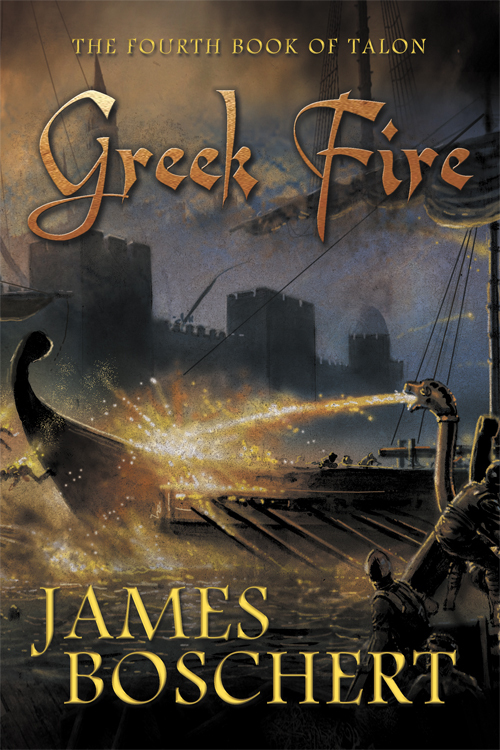 And beneath the pageantry of the great city, seditious plans are being fomented by disaffected aristocrats who have made a reckless deal with Arab pirates to sell the one weapon the Byzantine Empire has to defend itself, Greek Fire, to an implacable enemy bent upon the Empire’s destruction. Talon and Max will find themselves in a fight for their lives – on the sea in perilous battles, and in the labyrinthine back streets of Constantinople where Talon must outwit his own kind, the assassins in the pay of a treacherous alliance.